We have two places that you can join us. Well, actually a few. - Special Notices (you'll receive no email in your inbox. You'll be able to login and read mail at anytime on the web) Choose this option over "no mail" so that you will get important or urgent info from the owner of Mom Pack only. NOTE: When you join our interactive list, you will receive a few emails (automatically sent files) that contain the rules and how we manage these lists. It is important to read and follow these rules to make sure that you can maintain your membership. This area contains private information that we share with our members only. We do not share this access with anyone until they are approved on the above Interactive List. This area is actively viewed by members and visitors of MomPack.com. There are many board categories for you to interact with other visitors without clogging up your email boxes. TEMPORARILY CLOSED. Is there a membership type requirement? We have only one requirement. 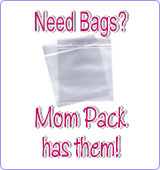 That is to have the common courtesy and appreciation to put a link back to MomPack.com on your site. If you have a company sponsored web site that you really cannot put a link to back to us, please help us elsewhere. We always need help spreading the word about MomPack. Some members that are in this situation are adding a link to us in their signature line on all outgoing messages that they send. Some are checking links and reporting back to us of what we should add or tend to on mompack.com. Volunteers run this site - please, help us help you. Nothing. We work hard to keep this site free for our members. We do have sponsor spots available if you'd like to sponsor our site and receive prime space advertising on our very active web site. This is optional and all profits go into our Member Give Back Program. It's a win-win situation for our sponsors and members. What is a Mom Pack? How do I get started sending my Fillers? Who is behind Mom Pack? Julie Ryals. Is the backbone that supports, maintains and handles the daily operations on MomPack.com along with her amazing staff who handle the interactive list portion of mompack.com. Without them, this would not be possible. The Design Shoppe is the designer and the web host for mompack.com. Although, we do have to thank Lynn Korff for getting MomPack.com started. Lynn has a very active business creating Personalized Piggies and continues to focus on that while staying a silent member of Mom Pack. I cannot forget to thank our valued helpers! The list is long and can be viewed here. Hugs to all of you for spending time in the growth and maintenance of MomPack.com! I'm not a "mom". Can I still join? Oh Absolutely! We welcome moms-to-be, grandmoms, great-grandmoms, adoptive moms, work at home moms, work out of the home moms, etc. !